What grammar really is and how we use it. To read more reviews of the book, click here. Have you noticed that supermarkets changed the signs for their Express Check-out tills from Ten items or less to Ten items or fewer? Did you wonder why? (Is less really wrong?) And if someone in your family gets a birthday card, do you ask them Who’s it from? or Whom is it from? Are they both correct English? Prize-winning author Dr Dave Willis questions traditional views of what is right or wrong in English grammar. In four short polemic chapters, he tackles head-on some typical claims of prescriptive grammarians. He defends his views with ample evidence from well accredited linguistic sources, electronic data-bases and up to date reference works. He opens up some of the true complexities of grammar, which, amazingly, our human brains seem to handle quite effortlessly. And he does all this with humour and panache. In the next six chapters Dr Willis explores the extensive world of grammar, revealing that there is far more to grammar than meets the eye, or – in the case of the grammar of spoken language- more than meets the ear. He guides us through various grammar landscapes, illustrating five distinct aspects of grammar. He sheds light on the functions and purposes of grammar and shows us how we subconsciously adapt our language to suit whatever situation we are in. He gives engaging commentaries on regional dialects and language change over the years, which explains why we don’t speak like Shakespeare or Chaucer. He explores the grammar of informal, spontaneous spoken English and shows how it differs from carefully crafted formal language. He debunks the myth that there is just one correct grammar and reassures us that we all know far more English grammar than we think we do. In the final two chapters Dave’s intention was to explore educational implications: how far can we actually teach grammar? Should we try, and, if so, how? What’s the best way of learning good grammar? The linguistic journey that children set out on at birth and continue when they start school – where they need to move from spontaneous conversational English to more formal spoken and written English – is not without its hazards. Adults, too, enter new linguistic landscapes when they enter work, change jobs, start a new leisure activity, or learn a foreign language. This is the focus of the two final chapters, written by his wife, Jane, after Dave’s untimely death in October 2013. She suggests ways that adults can become better speakers and writers, and advises on ways to learn a foreign language. She sets out clear advice for parents, carers and teachers who have children’s language development at heart. 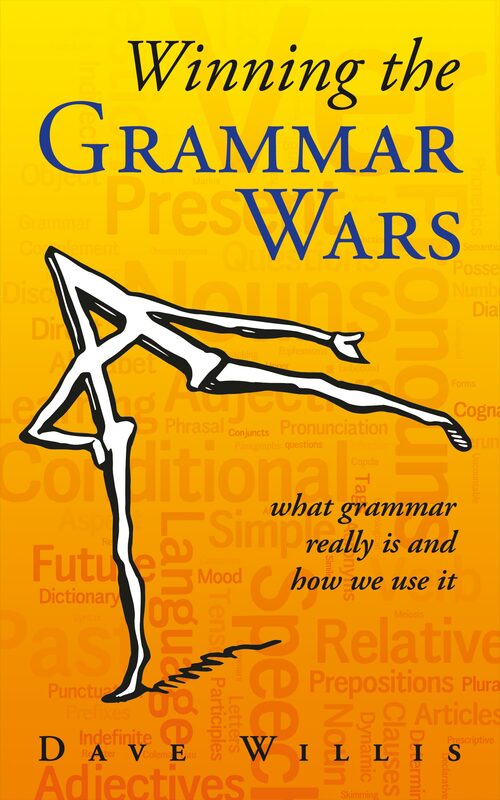 The Grammar Wars Appendices on this web-site contain suggestions for parents and practical activities for teachers that will fuel children on their linguistic journey and help them to feel confident and enjoy using language to the full. To see Winning the Grammar Wars Contents Page, click here. He retired from teaching in 1999 and wrote two more books, Rules, Patterns and Words: Grammar and Lexis in English Language Teaching (CUP) and, with his wife, Jane, Doing Task-based Teaching (OUP). 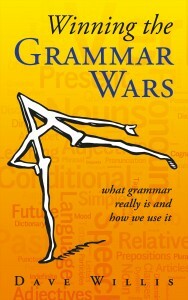 He had nearly finished Winning the Grammar Wars: what grammar really is and how we use it – his first book for a general readership – when he died in October 2013 during heart surgery. His wife, Jane Willis, completed the book with help from friends, family and colleagues. To purchase the book from the Amazon bookstore for Kindle click here. For more details of his other publications click here.